As the youngest of six children, he left home at the age of 18. He went to New York and he attended classes at the Manning Street Actor's Theatre and at Circle-in-the-Square. He began his professional acting career on off-Broadway stages, where he first made himself a reputation by playing the part of drug-addict and male-prostitute Rickey in Alan Brown's Forty Deuce. He received an Obie award for this performance. He acted the same part later in P. Morrissey's film version. He made his debut on Broadway in 1983 beside Sean Penn, in the John Byrne's play Slab Boys. At the end of the 70's, he made TV and movie appearances. He was first noticed here through his role of Fenwick, a young man with an alcohol problem in the movie Diner. He also caught the public's attention by his leading role of a city-boy, who moves into a small town with a different attitude in the classic movie Footloose. Another successful role for Kev was his easy-going character by the name of Jack Briggs, whose premature marriage complicates his life in the bitter comedy She's Having a Baby. He also did a great job in the horror movie Flatliners, where he acts the part of a doctor, David Labraccio, who, together with his colleagues, gets involved in experiments with clinical death. Kev lived 6 years with the actress Tracy Pollard (who later married Michael J. Fox), marrying Kyra Sedgewick in 1988. He began his professional acting career off-Broadway in Alan Brown's Forty Deuce, receiving an Obie award for his performance. His Broadway debut came in 1983, co-starring with Sean Penn and Val Kilmer in the John Byrne play, Slab Boys. After Broadway, Bacon had a brief stint on the TV soap opera, Guiding Light. He made his Hollywood debut as Chip in National Lampoon's Animal House (1978). Soon afterward, he gained notice for a fine performance as the hotheaded alcoholic Fenwick in Barry Levinson's classic ensemble film Diner (1982). Bacon was launched into mainstream stardom by his lead role in Footloose (1984), a lightweight confection about a city boy who shakes up a small, religious town by dancing. In the 1990s, he had notable roles in Oliver Stone's JFK (1991), A Few Good Men (1992) with Tom Cruise and Jack Nicholson, Ron Howard's Apollo 13 (1995), and in Barry Levinson's Sleepers (1996). Bacon received a Golden Globe nomination for his menacing role in The River Wild (1995) with Meryl Streep. In 1998, Bacon starred in Wild Things, with Neve Campbell and Matt Dillon. More recent cinematic efforts include the thriller Stir of Echoes (1999) and the family-fare hit My Dog Skip (2000) with Diane Lane and Frankie Muniz. In August 2000, Bacon scored a box office hit with the science-fiction thriller Hollow Man. After collaborating for 20 years, Bacon and his brother Michael formed a rhythm and blues band in 1994. As The Bacon Brothers, they have performed in clubs and coffee shops in New York City and appeared on The Rosie O'Donnell Show, The Tonight Show with Jay Leno, and at Elizabeth Taylor's 65th birthday celebration, hosted by ABC. The band has also released several albums, including Forosoco (1997), Getting There (1999), and Can't Complain (2001). During the filming of the American Playhouse production of Lemon Sky (1987), Bacon met actress Kyra Sedgwick, whom he married in 1988. The couple lives in Manhattan with their two children, Travis and Sosie Ruth. Both Bacon and Sedgwick are active in a variety of environmental and charity projects. Bacon was the subject of a curious bit of late 1990s pop culture. 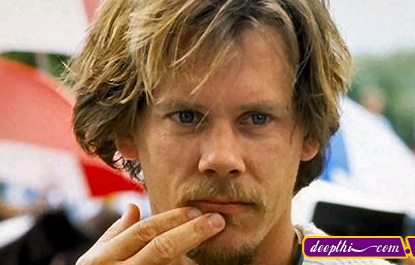 A trio of Pennsylvania college students concocted "Six Degrees of Kevin Bacon," an amusing parlor game in which participants must link any actor, living or dead, to Kevin Bacon in fewer than six links. For example, Rudolph Valentino has a "Bacon Factor" of 3 -- Valentino was in The Son of the Sheik (1926) with Montague Love, who was in All This, and Heaven Too (1940) with June Lockhart, who was in The Big Picture (1989) with Bacon. Word-of-mouth, mainstream media, and the power of the Internet helped the game become a cult favorite.